Great location, great race, attracts a lot of spectators, and there is a large list of charity pledge program. 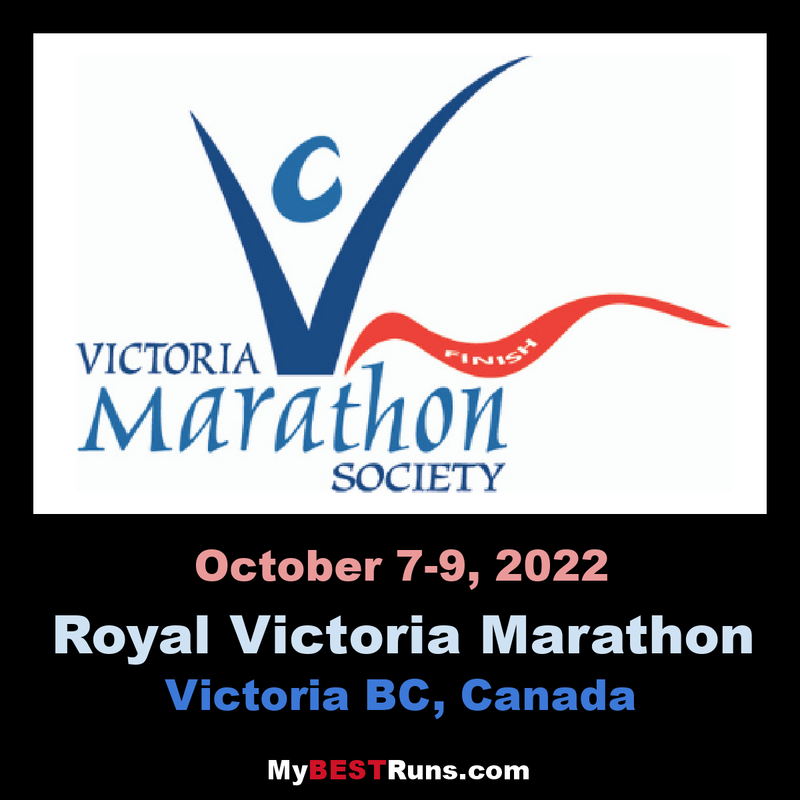 The GoodLife Fitness Victoria Marathon, Half-Marathon and 8K races took place Sunday, October 9 in near perfect conditions, especially for the marathon. There were over 8,000 competitors in the three races including the kid's fun run. The winners of the marathon were Daniel Kipkoech of Kenya and Sabrina Wilkie of Vancouver. Kipkoech led the entire way and finished nearly nine minutes in front of second place finisher Bryan Andrews of Calgary. Andrews ran a personal best of 2:29:00, which is approximately a 45-second improvement over his previous best. Kipkoech cruised in at 2:20:33. James Desalvo finished third in the time of 2:35:05, he was also the first master (40-plus). Kipkoech is a three time winner of the event. He won in 2014 and 2015, he, along with Steve Osadiuk and Kelvin Broad are the only other three-consecutive time winners of Victoria. "I slowed down a little bit because there was no one to share the lead with," said Kipkoech. "If there was someone else up front with me, we would have run 2:15 or faster." GoodLife was Wilkie's debut at the distance. She was up against Portland, Oregon's Eva Vail, wife of 2:10:57 marathon runner Ryan Vail. Wilkie stayed behind her for approximately 30-kilometres. "I think it was about 30K where I passed her," said the former UBC runner. "I ran my own race, but I know she wasn't too far ahead for the whole length before I passed her; it was good." Wilkie finished in 2:45:53, while Vail crossed the line in the time of 2:47:30. Andrea Lee finished in the time of 2:56:52. Elizabeth Waywell was the first master. She finished in the time of 3:09:06 and competes in the 55-59 age-category. In the half-marathon Kenyan Paul Kimugul prevailed over Vancouver's Rob Watson. They finished in the time of 1:07:19 and 1:09:55, respectively. The third place finisher was Jim Finlayson who doubled down as the masters champion, crossing the line in the time of 1:11:01. "It wasn't exactly what I was looking for. I was hoping to run under 1:07:00 as I would like to run under 2:20:00 at the New York Marathon next month," shared Watson, who retired from competitive international running, but keeps fit coaching others and training. "I have three weeks to put in some good hard work before New York," he added. In the women's half-marathon event Kenyan Jane Murage finished behind only eight men and recorded the time of 1:17:25. Asked about her time (she is typically capable of 1:13:00) she said, "I didn't want to work too hard in this one if I didn't have to, because in two weeks I would like to race the Rock 'n Roll Half Marathon. I would like to be ready for that one too." Maria Zambrano finished second, but also as first master and first in the 45-49 age-category in the time of 1:18:45. The third place finisher was Christina Overback Crawford, who finished in 1:20:13. In the 8K Calgary's Trevor Hofbauer crossed the line first in the time of 24:36. Brandan Laan from London, Ontario crossed the line in the time of 25:16, he virtually tied with Vancouver's Mark Wilkie, husband of the marathon winner Sabrina Wilkie. They were credited with the same time, but Laan did finish slightly ahead. The top junior was Tyler Dozzi. Dozzi finished fourth overall, beating his coach, two-time Olympian Bruce Deacon. Deacon finished two spots back as first master in the time of 26:27. Lindsay Carson of Whitehorse, Yukon is now a three-peat champion of this event. She won today's edition in the time of 27:35. When asked about her time, she seemed okay with it, "Not bad, but I ran in it 27:15 two years ago," she said. Justin Stecko finished in second place, while Lindsey Drake finished third. They were credited with the times of 29:32 and 29:44. The first female master was America Aznar, she finished in 32:59.